Transportation Committee, Big Blue Bus fare increase discussion, Kid’s Bike Day, a new Monrovia Station, group hike – plus more fun stuff early next week. Wednesday 9/9 – The Los Angeles City Council Transportation Committee discusses upcoming CicLAvias, crosswalk stings, and more. It meets at 3 p.m. at L.A. City Hall room 1010. More details on meeting agenda [PDF]. Thursday 9/10 – Santa Monica Big Blue Bus holds a community meeting on a planned fare increase, from 6 to 7:30 p.m. at the Santa Monica Main Library, 601 Santa Monica Blvd. Details here. Saturday 9/12 – The Foothill Gold Line Construction Authority is celebrating almost-completed light rail construction. The Authority will host dedication ceremonies at each of the new stations due to open in early 2016. This Saturday, celebrate the new Monrovia Station at 10 a.m. at 1651 S. Primrose Avenue, in Monrovia. Details here. Saturday 9/12 – Join a group hike in Griffith Park to benefit the New Urbanism Film Festival. Starts 9:30 a.m. at the carousel. Details at Facebook event. Kids Bike Day this Saturday! Click on image to make bigger. 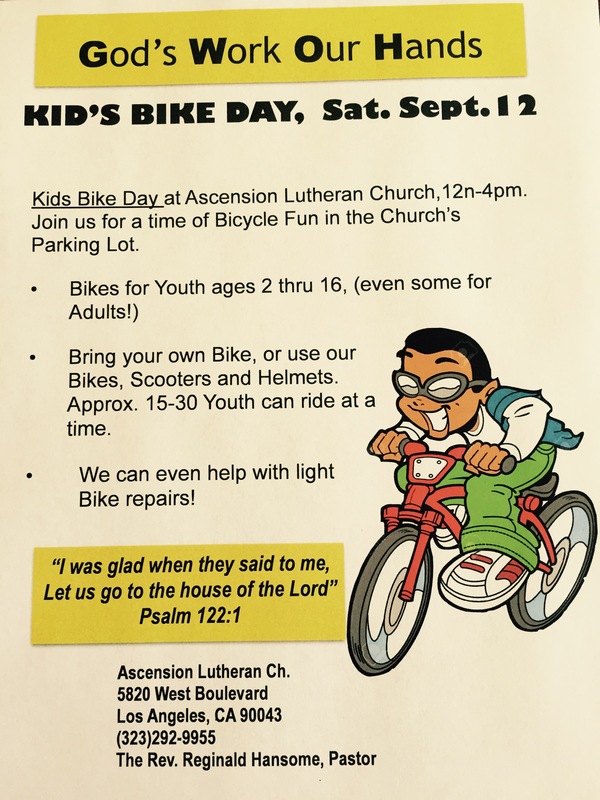 Saturday 9/12 – From noon to 4 p.m. it’s Kid’s Bike Day at Ascension Lutheran Church, 5820 West Boulevard in South L.A. See flier at right. Next Monday 9/14 – Grand opening for Metro’s El Monte Bike Hub. Festivities take place at 10 a.m. at El Monte Transit Center. Details at Facebook event. Next Monday 9/14 – The Silver Lake Neighborhood Council hosts a town hall meeting on the life-saving Rowena Road Diet. It takes place from 6 to 9 p.m. at Ivanhoe Elementary School at 2828 Herkimer Street in Silver Lake. Details at Facebook event. Next Week: volunteer for the L.A. County Bicycle Coalition’s annual September bike and walk count.